In addition to the overwhelming size and the opulence of Catherine's Palace, the intrigue surrounding one of its rooms makes it a favorite on any list of places to see. 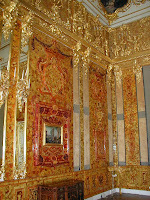 In 1716, the Amber Room was presented by the King Wilhelm I of Prussia to Peter the Great. 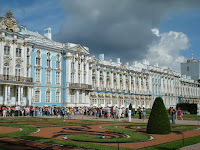 It was installed in 1755, in what is now known as Catherine's Palace. When the Nazis invaded Russia, Catherine's Palace, outside the city of St. Pet ersburg was ransacked and the amber panels taken and shipped to Konigsberg. Somewhere along the way, they disappeared. A few artifacts from the room have shown up here and there but the mystery of what happened to the original pieces has never been solved. 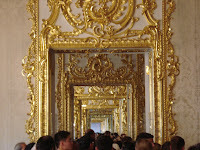 In 1979, reconstruction of the Amber Room began and was just completed this year in June. No pictures are allowed now in the room but on our first visit, when about a third of the new panels were installed, there was no restriction and we were able to get the picture you see here. 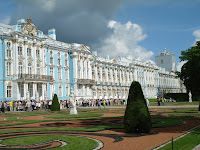 The palace was originally constructed by Catherine I, wife of Peter the Great, back in the early 1700s. 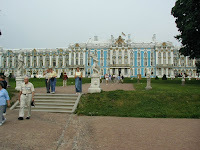 Over time it was torn down and rebuilt a couple of times and then brought into its present form by Catherine the Great. After the fall of the tsars, the palace became a museum until the Nazis visit which left it in ruins. It has become a monumental restoration project for the Russian people. One of the most amazing views as in the palace is as you stand on one end of a great hall that leads through all of the rooms and look to the other end of the palace. It is like looking into a mirror that reflects one of those optical illusions of depth to infinity. There are many sitting rooms and rooms wit h tables for eating. 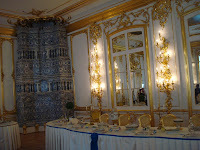 The dining room pictured has a delft ceramic covered unit in the corner to heat the room. All the floors are parquet designs with different colored woods making intricate patterned floors. Sleeping Beauty may have a castle, but Catherine's home is most definitely a palace.